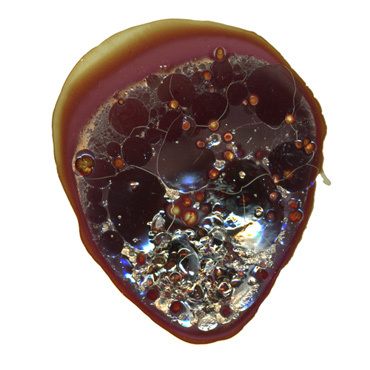 Trained as both a chemist and a photographer, Denis Roussel holds scientific practice as a mirror to artistic inquiry. His simple, pseudo-scientific experiments investigate essential qualities, paying great attention to detail and change over time. 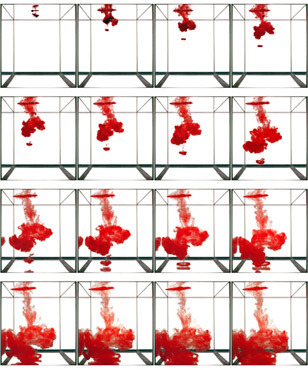 Blood Experiment 1 is comprised of three panels, each with its own perspective and each including 16 sequential images as blood interacts with water. 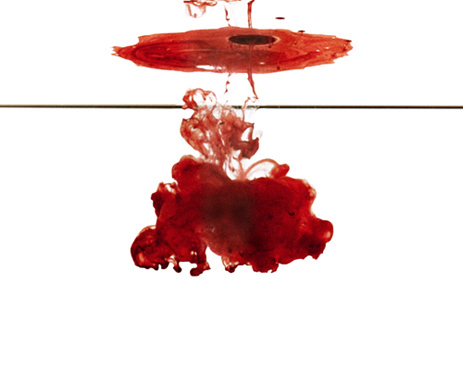 Blood Experiment 2, a single panel of five images, illustrates progressive decay as blood is exposed to air. Six prints make up Blood Experiment 3, each recording a state of change as blood is exposed to heat, its constituents evaporating or breaking down into carbon. If the blood work is decidedly graphic (in the visual/design sense), the six images that make up Remnants of Touch push more purely toward abstraction. In them, an inky black void is punctuated by the ambiguous shapes created as skin presses against a surface. Put another way, if the Blood Experiment pictures suggest science, then Remnants of Touch recalls alchemy. Denis Roussel was born in 1976 in Nantes, France. He holds a diplome d’ingenieur in chemistry and water treatment from Ecole Nationale Superiure Chimie in Rennes, France, and both an MA (2003) and MFA (2004) in photography from University of Iowa in Iowa City. 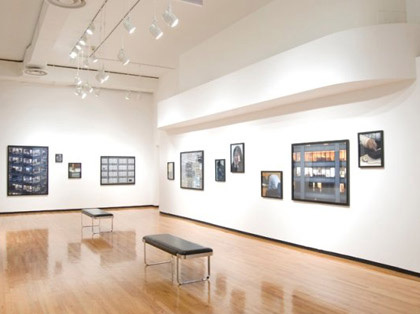 His work has been exhibited in Cedar Rapids, IA at CSPS and in Iowa City at IMU Gallery Space, Eve Drewelowe Gallery, and University of Iowa Hospitals and Clinics.